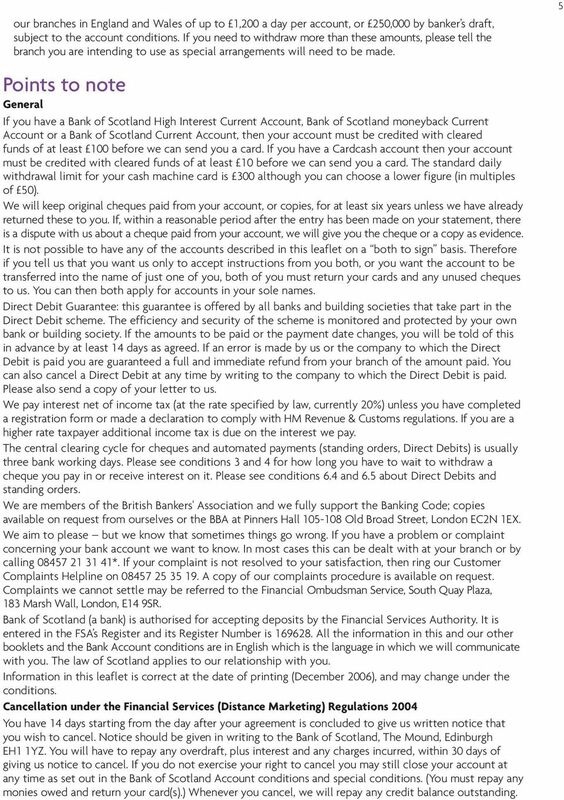 Download "Bank of Scotland Bank Accounts. 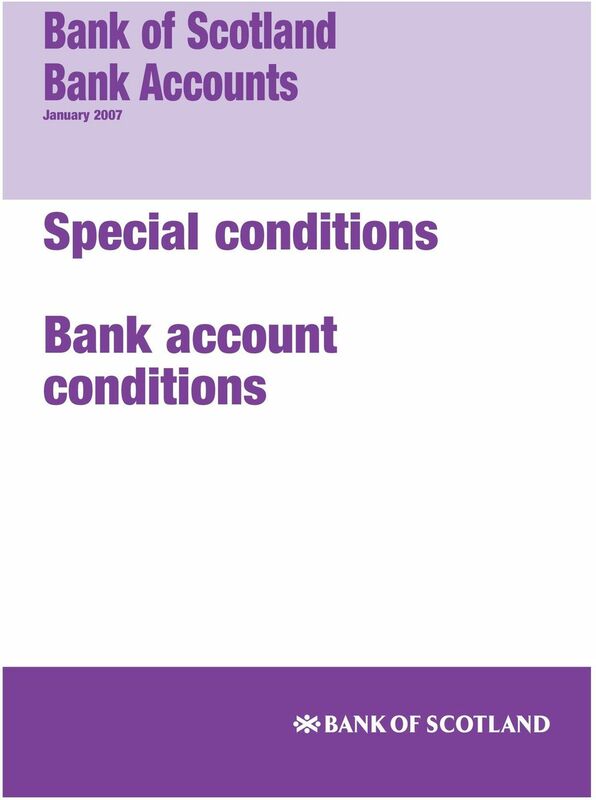 Special conditions"
2 2 Welcome to the Bank of Scotland Thank you for choosing to bank with the Bank of Scotland. 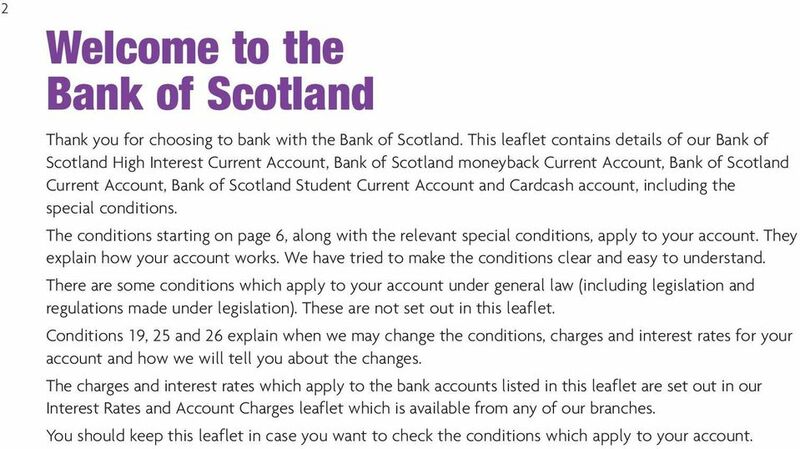 This leaflet contains details of our Bank of Scotland High Interest Current Account, Bank of Scotland moneyback Current Account, Bank of Scotland Current Account, Bank of Scotland Student Current Account and Cardcash account, including the special conditions. The conditions starting on page 6, along with the relevant special conditions, apply to your account. They explain how your account works. We have tried to make the conditions clear and easy to understand. There are some conditions which apply to your account under general law (including legislation and regulations made under legislation). These are not set out in this leaflet. 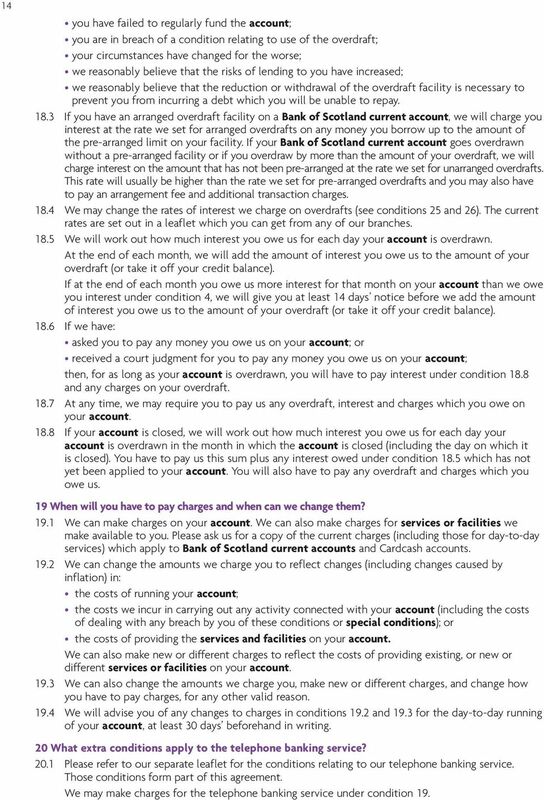 Conditions 19, 25 and 26 explain when we may change the conditions, charges and interest rates for your account and how we will tell you about the changes. The charges and interest rates which apply to the bank accounts listed in this leaflet are set out in our Interest Rates and Account Charges leaflet which is available from any of our branches. 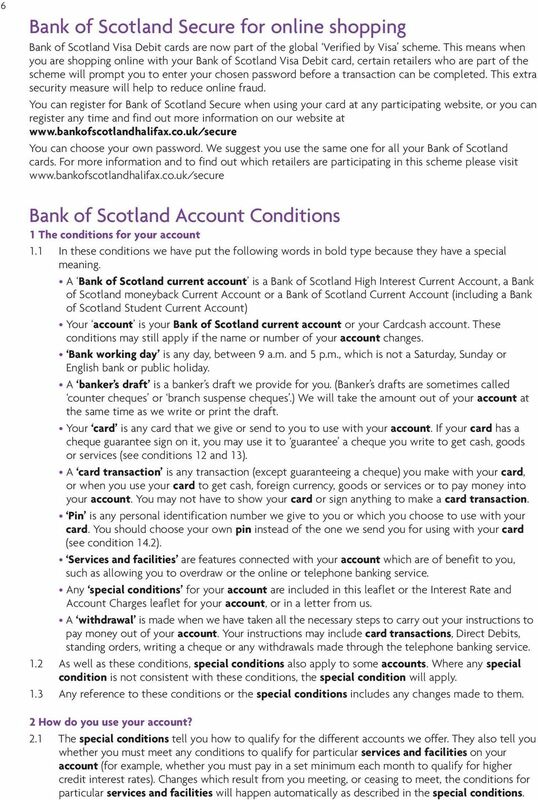 You should keep this leaflet in case you want to check the conditions which apply to your account. 6 6 Bank of Scotland Secure for online shopping Bank of Scotland Visa Debit cards are now part of the global Verified by Visa scheme. This means when you are shopping online with your Bank of Scotland Visa Debit card, certain retailers who are part of the scheme will prompt you to enter your chosen password before a transaction can be completed. This extra security measure will help to reduce online fraud. You can register for Bank of Scotland Secure when using your card at any participating website, or you can register any time and find out more information on our website at You can choose your own password. We suggest you use the same one for all your Bank of Scotland cards. 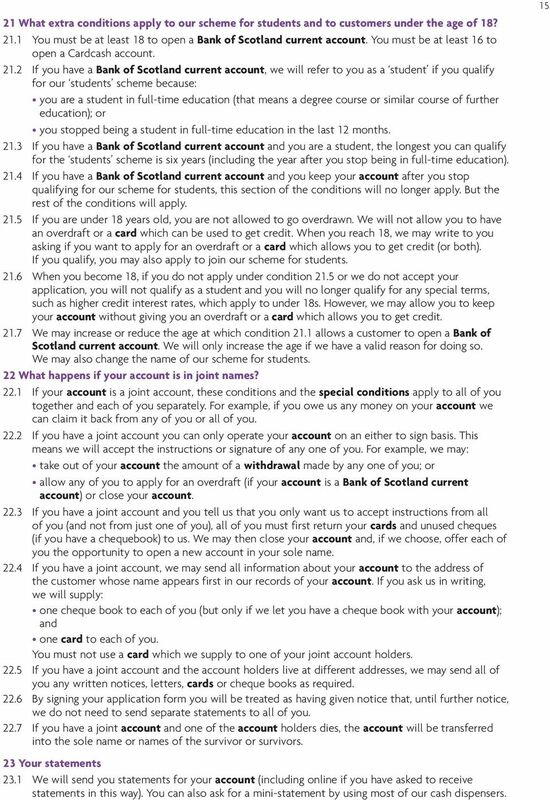 For more information and to find out which retailers are participating in this scheme please visit Bank of Scotland Account Conditions 1 The conditions for your account 1.1 In these conditions we have put the following words in bold type because they have a special meaning. 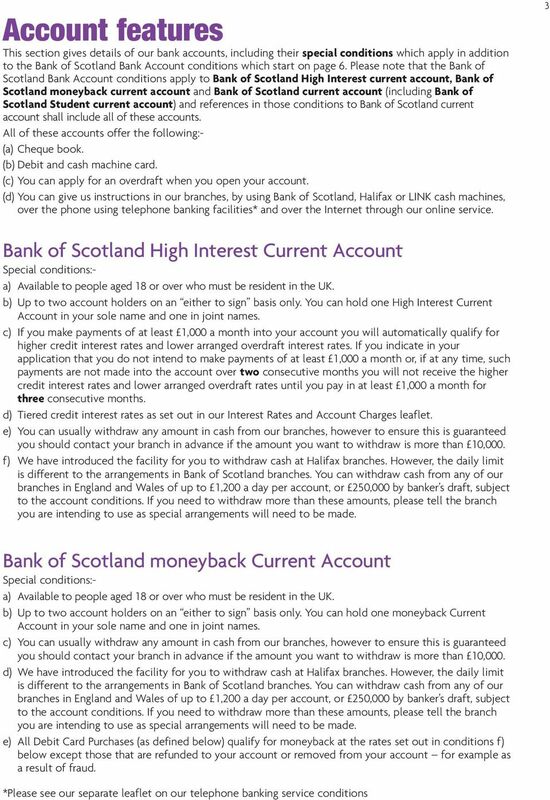 A Bank of Scotland current account is a Bank of Scotland High Interest Current Account, a Bank of Scotland moneyback Current Account or a Bank of Scotland Current Account (including a Bank of Scotland Student Current Account) Your account is your Bank of Scotland current account or your Cardcash account. These conditions may still apply if the name or number of your account changes. Bank working day is any day, between 9 a.m. and 5 p.m., which is not a Saturday, Sunday or English bank or public holiday. A banker s draft is a banker s draft we provide for you. (Banker s drafts are sometimes called counter cheques or branch suspense cheques.) We will take the amount out of your account at the same time as we write or print the draft. Your card is any card that we give or send to you to use with your account. If your card has a cheque guarantee sign on it, you may use it to guarantee a cheque you write to get cash, goods or services (see conditions 12 and 13). A card transaction is any transaction (except guaranteeing a cheque) you make with your card, or when you use your card to get cash, foreign currency, goods or services or to pay money into your account. You may not have to show your card or sign anything to make a card transaction. Pin is any personal identification number we give to you or which you choose to use with your card. You should choose your own pin instead of the one we send you for using with your card (see condition 14.2). Services and facilities are features connected with your account which are of benefit to you, such as allowing you to overdraw or the online or telephone banking service. Any special conditions for your account are included in this leaflet or the Interest Rate and Account Charges leaflet for your account, or in a letter from us. A withdrawal is made when we have taken all the necessary steps to carry out your instructions to pay money out of your account. Your instructions may include card transactions, Direct Debits, standing orders, writing a cheque or any withdrawals made through the telephone banking service. 1.2 As well as these conditions, special conditions also apply to some accounts. Where any special condition is not consistent with these conditions, the special condition will apply. 1.3 Any reference to these conditions or the special conditions includes any changes made to them. 2 How do you use your account? 2.1 The special conditions tell you how to qualify for the different accounts we offer. They also tell you whether you must meet any conditions to qualify for particular services and facilities on your account (for example, whether you must pay in a set minimum each month to qualify for higher credit interest rates). Changes which result from you meeting, or ceasing to meet, the conditions for particular services and facilities will happen automatically as described in the special conditions. 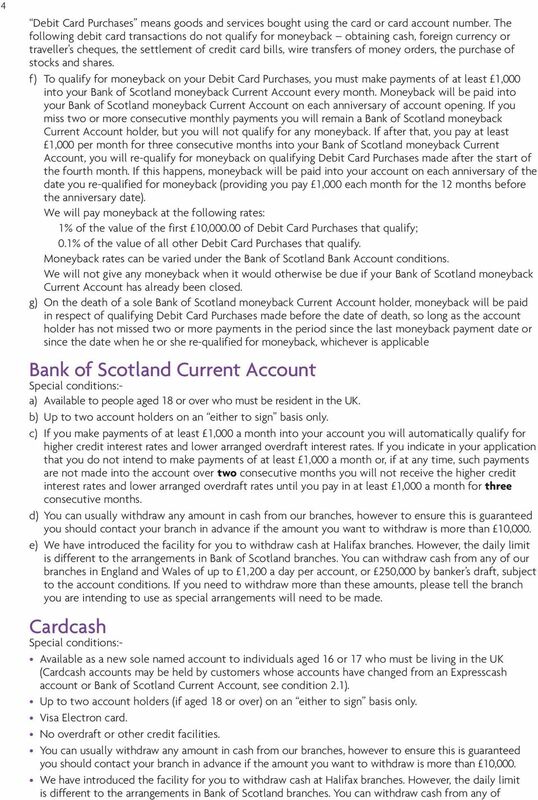 7 Your account may continue to be a Bank of Scotland current account or it may become a Cardcash account if we no longer wish you to have a Bank of Scotland current account. This will be because of the way in which your account has been conducted or because of a change in your personal financial circumstances which means that you no longer satisfy our criteria for current accounts. If this happens, the interest rates and charges and the special conditions for Cardcash accounts will apply, and we may replace your card with one that has the features of a Cardcash account. 2.2 You can only use your account as a personal account. You must not use it as a club, charity, trust, sole trader, company, partnership or other kind of business account, and you can only have an account if you are living in the UK. 2.3 We do not have to accept that anyone, apart from you, has any right to or interest in the money in your account (for example, if you are keeping some or all of the money in your account for someone else). 2.4 We will only accept instructions for your account from: you; anyone who has a legal right to give us instructions (for example, your trustee if you are made bankrupt); or anyone who you have authorised in writing (for example, someone who has a power of attorney for you) as long as we have accepted that written authority. 2.5 You may ask for the money in your account at any of our branches. You must not ask for it at the address which is printed on your cheques. 2.6 On any day you may only make withdrawals of up to the maximum amount we set for cash withdrawals and banker s drafts from: any of our branches; or any cash dispenser. (You must have enough money in your account or an arranged overdraft.) 2.7 We may limit the number of coins you can pay into your account in a day. You should not post cash to us. 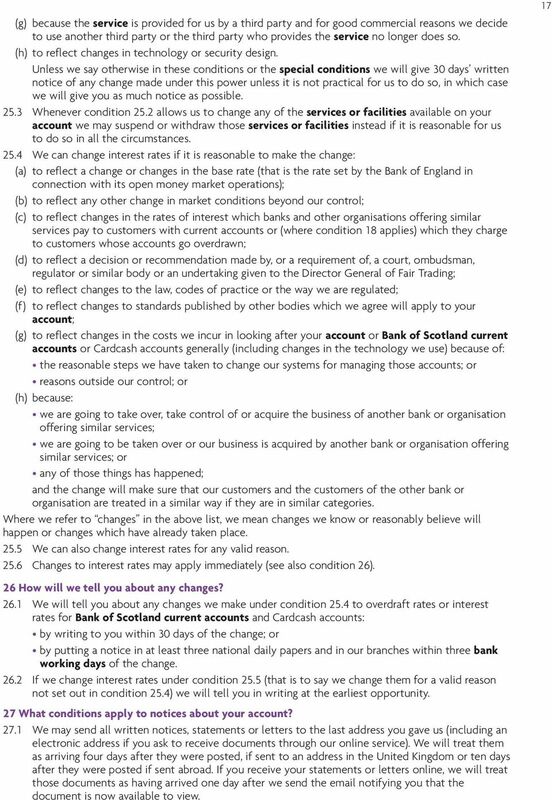 2.8 You will only be able to pay in a cheque payable to Bank of Scotland which is not drawn on your account if the cheque includes the name of the account holder or the number of the account. 2.9 If you make a transaction in a foreign currency, we will change the amount of the transaction to pounds sterling on the date we take it out of your account. We may also make a charge for this service. We will choose the exchange rate that will apply but we will always choose a reasonable one There are special arrangements if you want to pay foreign currency into your account or take it out. Ask us for details We may limit the amount you or someone else can pay into your account if we think this is necessary to: run our business lawfully; make sure our financial regulator approves of the way we run our business; or take account of changes in market conditions We may limit the amount you can take out of your account in any month if we think this is necessary to run our business lawfully and in a way which our regulator approves of. 7 3 If you pay money into your account, how long do you have to wait before you can take it out? 3.1 The table over sets out details of when you can withdraw funds paid into your account (except in those cases referred to in condition 5). In the table day(s) means bank working day(s) (see condition 1.1). 8 8 Type of payment 1. Cash 2. Cheques (Current Account ) 3. Cheques (Cardcash account) Where paid in In branch or using an Immediate Deposit Machine (IDM) Cash dispensers in England (except Berwick and Wooler), Wales and Northern Ireland Cash dispensers in Scotland and in Berwick and Wooler In branch, using an Immediate Deposit Machine (IDM), or post received before 5pm (4pm where Express Pay-In used) In branch, using an Immediate Deposit Machine (IDM), or post received after 5pm (4pm where Express Pay-In used) Cash dispensers (England, Wales, Northern Ireland and Scotland) In branch, using an Immediate Deposit Machine (IDM), or post received before 5pm (4pm where Express Pay-In used) In branch, using an Immediate Deposit Machine (IDM), or post received after 5pm (4pm where Express Pay-In used) Cash dispensers (England, Wales, Northern Ireland and Scotland) When you can withdraw funds Same day Three days later (not counting the day of deposit) e.g. pay in Monday withdraw Thursday Next day (not counting the day of deposit) e.g. 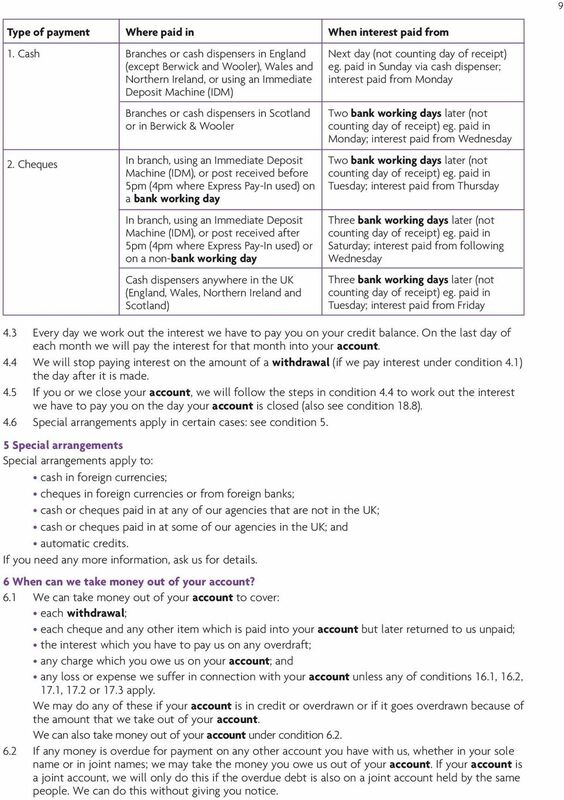 pay in Monday, withdraw Tuesday Three days later (not counting day of deposit) eg. pay in Monday, withdraw Thursday Four days later (not counting day of deposit) e.g. pay in Monday, withdraw Friday Four days later (not counting day of deposit) e.g. pay in Monday, withdraw Friday Four days later (not counting day of deposit) e.g. pay in Monday, withdraw Friday Five days later (not counting day of deposit) e.g. 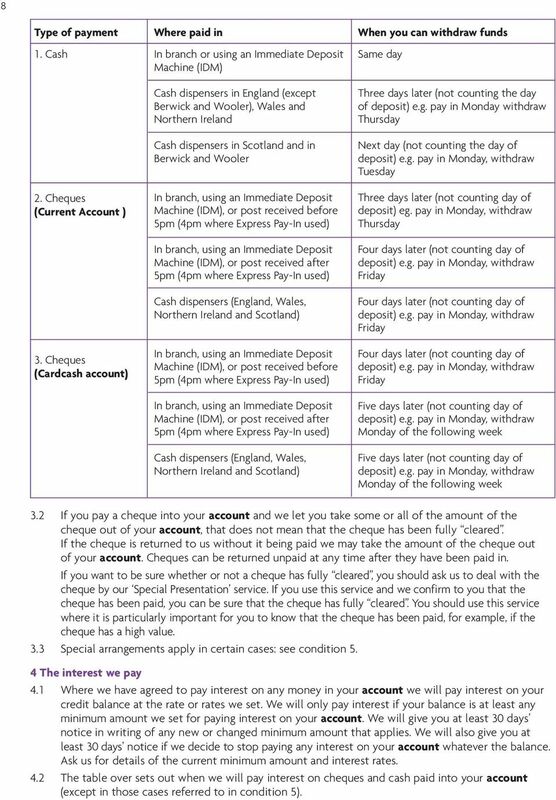 pay in Monday, withdraw Monday of the following week Five days later (not counting day of deposit) e.g. pay in Monday, withdraw Monday of the following week 3.2 If you pay a cheque into your account and we let you take some or all of the amount of the cheque out of your account, that does not mean that the cheque has been fully cleared. If the cheque is returned to us without it being paid we may take the amount of the cheque out of your account. Cheques can be returned unpaid at any time after they have been paid in. If you want to be sure whether or not a cheque has fully cleared, you should ask us to deal with the cheque by our Special Presentation service. If you use this service and we confirm to you that the cheque has been paid, you can be sure that the cheque has fully cleared. You should use this service where it is particularly important for you to know that the cheque has been paid, for example, if the cheque has a high value. 3.3 Special arrangements apply in certain cases: see condition 5. 4 The interest we pay 4.1 Where we have agreed to pay interest on any money in your account we will pay interest on your credit balance at the rate or rates we set. We will only pay interest if your balance is at least any minimum amount we set for paying interest on your account. We will give you at least 30 days notice in writing of any new or changed minimum amount that applies. We will also give you at least 30 days notice if we decide to stop paying any interest on your account whatever the balance. Ask us for details of the current minimum amount and interest rates. 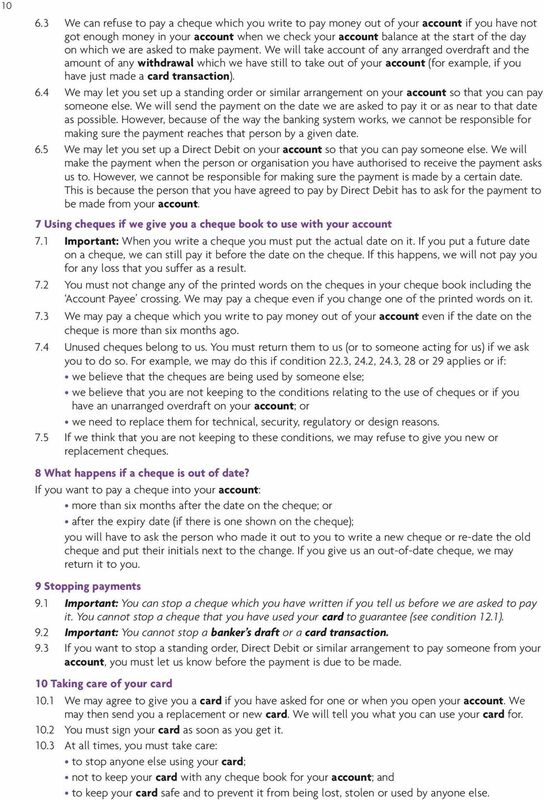 4.2 The table over sets out when we will pay interest on cheques and cash paid into your account (except in those cases referred to in condition 5). 9 9 Type of payment 1. Cash 2. Cheques Where paid in Branches or cash dispensers in England (except Berwick and Wooler), Wales and Northern Ireland, or using an Immediate Deposit Machine (IDM) Branches or cash dispensers in Scotland or in Berwick & Wooler In branch, using an Immediate Deposit Machine (IDM), or post received before 5pm (4pm where Express Pay-In used) on a bank working day In branch, using an Immediate Deposit Machine (IDM), or post received after 5pm (4pm where Express Pay-In used) or on a non-bank working day Cash dispensers anywhere in the UK (England, Wales, Northern Ireland and Scotland) When interest paid from Next day (not counting day of receipt) eg. paid in Sunday via cash dispenser; interest paid from Monday Two bank working days later (not counting day of receipt) eg. paid in Monday; interest paid from Wednesday Two bank working days later (not counting day of receipt) eg. paid in Tuesday; interest paid from Thursday Three bank working days later (not counting day of receipt) eg. paid in Saturday; interest paid from following Wednesday Three bank working days later (not counting day of receipt) eg. paid in Tuesday; interest paid from Friday 4.3 Every day we work out the interest we have to pay you on your credit balance. On the last day of each month we will pay the interest for that month into your account. 4.4 We will stop paying interest on the amount of a withdrawal (if we pay interest under condition 4.1) the day after it is made. 4.5 If you or we close your account, we will follow the steps in condition 4.4 to work out the interest we have to pay you on the day your account is closed (also see condition 18.8). 4.6 Special arrangements apply in certain cases: see condition 5. 5 Special arrangements Special arrangements apply to: cash in foreign currencies; cheques in foreign currencies or from foreign banks; cash or cheques paid in at any of our agencies that are not in the UK; cash or cheques paid in at some of our agencies in the UK; and automatic credits. If you need any more information, ask us for details. 6 When can we take money out of your account? 6.1 We can take money out of your account to cover: each withdrawal; each cheque and any other item which is paid into your account but later returned to us unpaid; the interest which you have to pay us on any overdraft; any charge which you owe us on your account; and any loss or expense we suffer in connection with your account unless any of conditions 16.1, 16.2, 17.1, 17.2 or 17.3 apply. We may do any of these if your account is in credit or overdrawn or if it goes overdrawn because of the amount that we take out of your account. We can also take money out of your account under condition If any money is overdue for payment on any other account you have with us, whether in your sole name or in joint names; we may take the money you owe us out of your account. If your account is a joint account, we will only do this if the overdue debt is also on a joint account held by the same people. We can do this without giving you notice. 10 We can refuse to pay a cheque which you write to pay money out of your account if you have not got enough money in your account when we check your account balance at the start of the day on which we are asked to make payment. We will take account of any arranged overdraft and the amount of any withdrawal which we have still to take out of your account (for example, if you have just made a card transaction). 6.4 We may let you set up a standing order or similar arrangement on your account so that you can pay someone else. We will send the payment on the date we are asked to pay it or as near to that date as possible. However, because of the way the banking system works, we cannot be responsible for making sure the payment reaches that person by a given date. 6.5 We may let you set up a Direct Debit on your account so that you can pay someone else. We will make the payment when the person or organisation you have authorised to receive the payment asks us to. However, we cannot be responsible for making sure the payment is made by a certain date. This is because the person that you have agreed to pay by Direct Debit has to ask for the payment to be made from your account. 7 Using cheques if we give you a cheque book to use with your account 7.1 Important: When you write a cheque you must put the actual date on it. If you put a future date on a cheque, we can still pay it before the date on the cheque. If this happens, we will not pay you for any loss that you suffer as a result. 7.2 You must not change any of the printed words on the cheques in your cheque book including the Account Payee crossing. We may pay a cheque even if you change one of the printed words on it. 7.3 We may pay a cheque which you write to pay money out of your account even if the date on the cheque is more than six months ago. 7.4 Unused cheques belong to us. You must return them to us (or to someone acting for us) if we ask you to do so. For example, we may do this if condition 22.3, 24.2, 24.3, 28 or 29 applies or if: we believe that the cheques are being used by someone else; we believe that you are not keeping to the conditions relating to the use of cheques or if you have an unarranged overdraft on your account; or we need to replace them for technical, security, regulatory or design reasons. 7.5 If we think that you are not keeping to these conditions, we may refuse to give you new or replacement cheques. 8 What happens if a cheque is out of date? If you want to pay a cheque into your account: more than six months after the date on the cheque; or after the expiry date (if there is one shown on the cheque); you will have to ask the person who made it out to you to write a new cheque or re-date the old cheque and put their initials next to the change. If you give us an out-of-date cheque, we may return it to you. 9 Stopping payments 9.1 Important: You can stop a cheque which you have written if you tell us before we are asked to pay it. 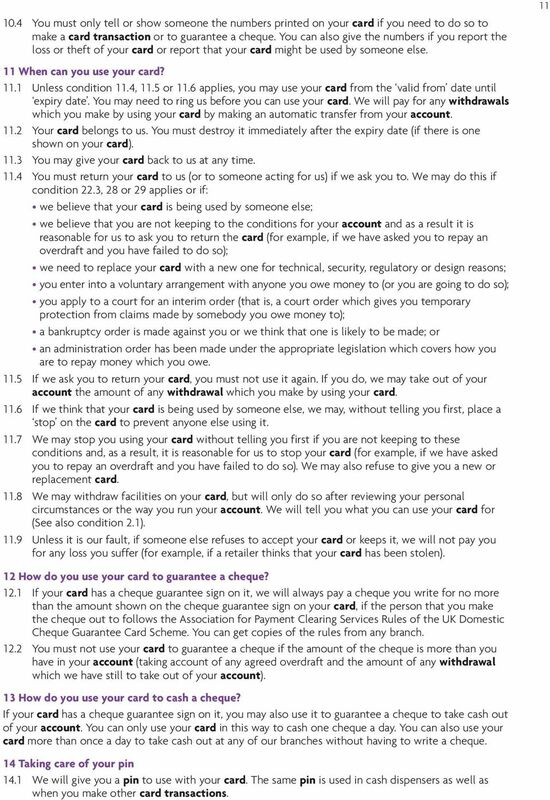 You cannot stop a cheque that you have used your card to guarantee (see condition 12.1). 9.2 Important: You cannot stop a banker s draft or a card transaction. 9.3 If you want to stop a standing order, Direct Debit or similar arrangement to pay someone from your account, you must let us know before the payment is due to be made. 10 Taking care of your card 10.1 We may agree to give you a card if you have asked for one or when you open your account. We may then send you a replacement or new card. We will tell you what you can use your card for You must sign your card as soon as you get it At all times, you must take care: to stop anyone else using your card; not to keep your card with any cheque book for your account; and to keep your card safe and to prevent it from being lost, stolen or used by anyone else. 12 When you get the pin you should change it to a number that you will remember easily. We will tell you how to do this You must take all reasonable steps to keep your pin secret at all times. You must: take every care to stop anyone else using it; immediately destroy the piece of paper we send you to tell you what your pin is; and not write your pin on your card or anything usually kept with it If you do write your pin down, you must disguise it so that no-one will know it is a pin. 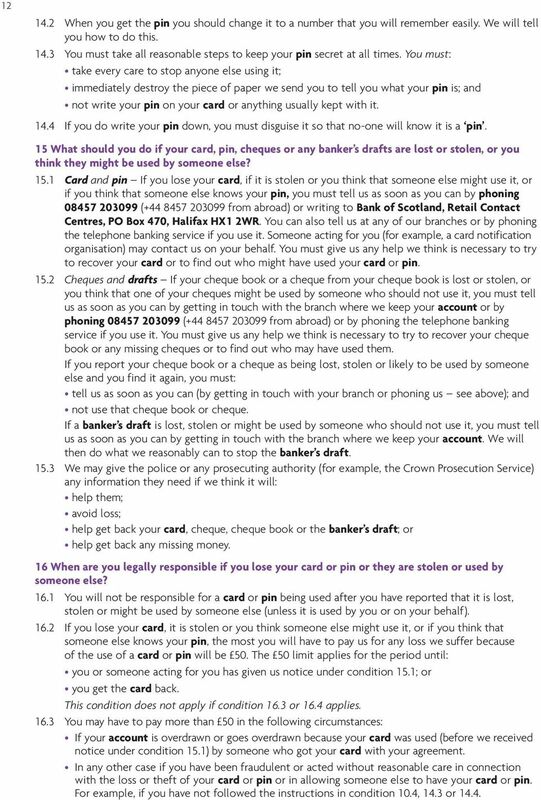 15 What should you do if your card, pin, cheques or any banker s drafts are lost or stolen, or you think they might be used by someone else? 15.1 Card and pin If you lose your card, if it is stolen or you think that someone else might use it, or if you think that someone else knows your pin, you must tell us as soon as you can by phoning ( from abroad) or writing to Bank of Scotland, Retail Contact Centres, PO Box 470, Halifax HX1 2WR. You can also tell us at any of our branches or by phoning the telephone banking service if you use it. Someone acting for you (for example, a card notification organisation) may contact us on your behalf. You must give us any help we think is necessary to try to recover your card or to find out who might have used your card or pin Cheques and drafts If your cheque book or a cheque from your cheque book is lost or stolen, or you think that one of your cheques might be used by someone who should not use it, you must tell us as soon as you can by getting in touch with the branch where we keep your account or by phoning ( from abroad) or by phoning the telephone banking service if you use it. You must give us any help we think is necessary to try to recover your cheque book or any missing cheques or to find out who may have used them. If you report your cheque book or a cheque as being lost, stolen or likely to be used by someone else and you find it again, you must: tell us as soon as you can (by getting in touch with your branch or phoning us see above); and not use that cheque book or cheque. If a banker s draft is lost, stolen or might be used by someone who should not use it, you must tell us as soon as you can by getting in touch with the branch where we keep your account. We will then do what we reasonably can to stop the banker s draft We may give the police or any prosecuting authority (for example, the Crown Prosecution Service) any information they need if we think it will: help them; avoid loss; help get back your card, cheque, cheque book or the banker s draft; or help get back any missing money. 16 When are you legally responsible if you lose your card or pin or they are stolen or used by someone else? 16.1 You will not be responsible for a card or pin being used after you have reported that it is lost, stolen or might be used by someone else (unless it is used by you or on your behalf) If you lose your card, it is stolen or you think someone else might use it, or if you think that someone else knows your pin, the most you will have to pay us for any loss we suffer because of the use of a card or pin will be 50. The 50 limit applies for the period until: you or someone acting for you has given us notice under condition 15.1; or you get the card back. This condition does not apply if condition 16.3 or 16.4 applies You may have to pay more than 50 in the following circumstances: If your account is overdrawn or goes overdrawn because your card was used (before we received notice under condition 15.1) by someone who got your card with your agreement. In any other case if you have been fraudulent or acted without reasonable care in connection with the loss or theft of your card or pin or in allowing someone else to have your card or pin. For example, if you have not followed the instructions in condition 10.4, 14.3 or 14.4. 14 14 you have failed to regularly fund the account; you are in breach of a condition relating to use of the overdraft; your circumstances have changed for the worse; we reasonably believe that the risks of lending to you have increased; we reasonably believe that the reduction or withdrawal of the overdraft facility is necessary to prevent you from incurring a debt which you will be unable to repay If you have an arranged overdraft facility on a Bank of Scotland current account, we will charge you interest at the rate we set for arranged overdrafts on any money you borrow up to the amount of the pre-arranged limit on your facility. If your Bank of Scotland current account goes overdrawn without a pre-arranged facility or if you overdraw by more than the amount of your overdraft, we will charge interest on the amount that has not been pre-arranged at the rate we set for unarranged overdrafts. This rate will usually be higher than the rate we set for pre-arranged overdrafts and you may also have to pay an arrangement fee and additional transaction charges We may change the rates of interest we charge on overdrafts (see conditions 25 and 26). The current rates are set out in a leaflet which you can get from any of our branches We will work out how much interest you owe us for each day your account is overdrawn. At the end of each month, we will add the amount of interest you owe us to the amount of your overdraft (or take it off your credit balance). If at the end of each month you owe us more interest for that month on your account than we owe you interest under condition 4, we will give you at least 14 days notice before we add the amount of interest you owe us to the amount of your overdraft (or take it off your credit balance) If we have: asked you to pay any money you owe us on your account; or received a court judgment for you to pay any money you owe us on your account; then, for as long as your account is overdrawn, you will have to pay interest under condition 18.8 and any charges on your overdraft At any time, we may require you to pay us any overdraft, interest and charges which you owe on your account If your account is closed, we will work out how much interest you owe us for each day your account is overdrawn in the month in which the account is closed (including the day on which it is closed). You have to pay us this sum plus any interest owed under condition 18.5 which has not yet been applied to your account. You will also have to pay any overdraft and charges which you owe us. 19 When will you have to pay charges and when can we change them? 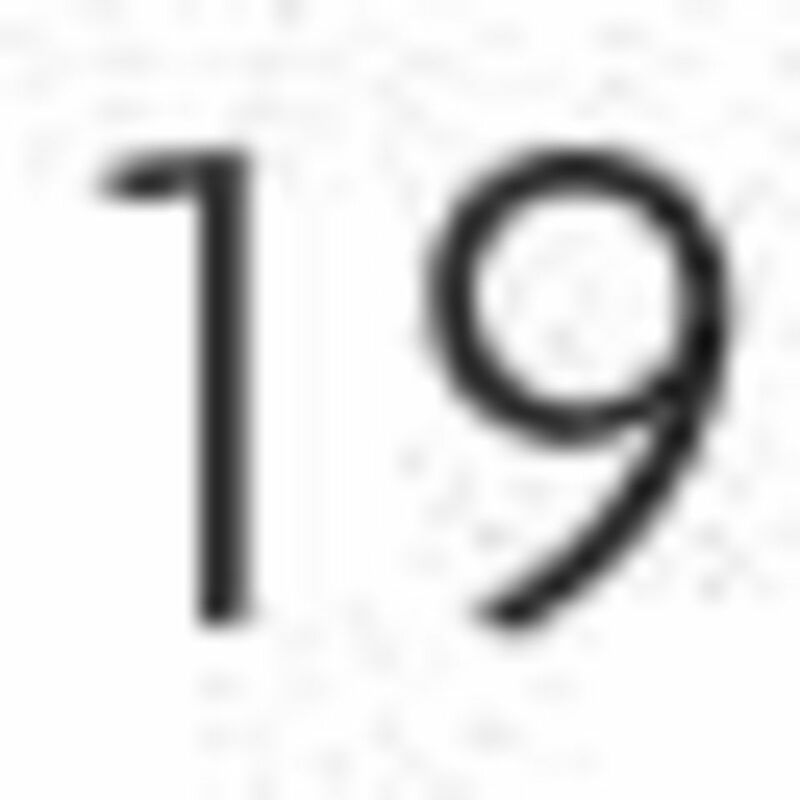 19.1 We can make charges on your account. We can also make charges for services or facilities we make available to you. 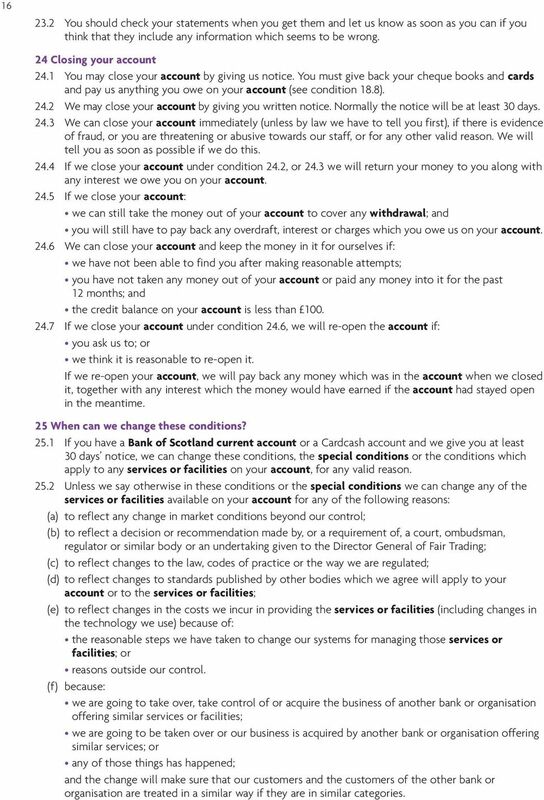 Please ask us for a copy of the current charges (including those for day-to-day services) which apply to Bank of Scotland current accounts and Cardcash accounts We can change the amounts we charge you to reflect changes (including changes caused by inflation) in: the costs of running your account; the costs we incur in carrying out any activity connected with your account (including the costs of dealing with any breach by you of these conditions or special conditions); or the costs of providing the services and facilities on your account. We can also make new or different charges to reflect the costs of providing existing, or new or different services or facilities on your account We can also change the amounts we charge you, make new or different charges, and change how you have to pay charges, for any other valid reason We will advise you of any changes to charges in conditions 19.2 and 19.3 for the day-to-day running of your account, at least 30 days beforehand in writing. 20 What extra conditions apply to the telephone banking service? 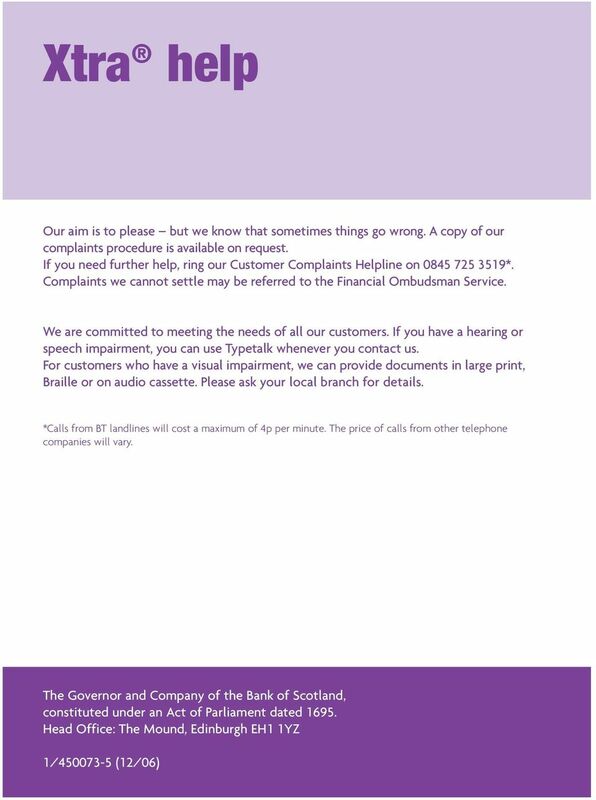 20.1 Please refer to our separate leaflet for the conditions relating to our telephone banking service. Those conditions form part of this agreement. We may make charges for the telephone banking service under condition 19. 16 You should check your statements when you get them and let us know as soon as you can if you think that they include any information which seems to be wrong. 24 Closing your account 24.1 You may close your account by giving us notice. 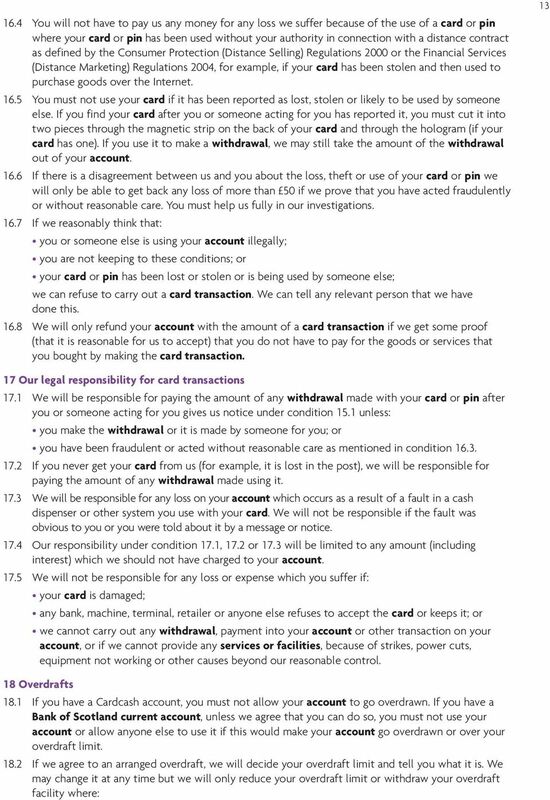 You must give back your cheque books and cards and pay us anything you owe on your account (see condition 18.8) We may close your account by giving you written notice. Normally the notice will be at least 30 days We can close your account immediately (unless by law we have to tell you first), if there is evidence of fraud, or you are threatening or abusive towards our staff, or for any other valid reason. We will tell you as soon as possible if we do this If we close your account under condition 24.2, or 24.3 we will return your money to you along with any interest we owe you on your account If we close your account: we can still take the money out of your account to cover any withdrawal; and you will still have to pay back any overdraft, interest or charges which you owe us on your account We can close your account and keep the money in it for ourselves if: we have not been able to find you after making reasonable attempts; you have not taken any money out of your account or paid any money into it for the past 12 months; and the credit balance on your account is less than If we close your account under condition 24.6, we will re-open the account if: you ask us to; or we think it is reasonable to re-open it. If we re-open your account, we will pay back any money which was in the account when we closed it, together with any interest which the money would have earned if the account had stayed open in the meantime. 25 When can we change these conditions? 25.1 If you have a Bank of Scotland current account or a Cardcash account and we give you at least 30 days notice, we can change these conditions, the special conditions or the conditions which apply to any services or facilities on your account, for any valid reason Unless we say otherwise in these conditions or the special conditions we can change any of the services or facilities available on your account for any of the following reasons: (a) to reflect any change in market conditions beyond our control; (b) to reflect a decision or recommendation made by, or a requirement of, a court, ombudsman, regulator or similar body or an undertaking given to the Director General of Fair Trading; (c) to reflect changes to the law, codes of practice or the way we are regulated; (d) to reflect changes to standards published by other bodies which we agree will apply to your account or to the services or facilities; (e) to reflect changes in the costs we incur in providing the services or facilities (including changes in the technology we use) because of: the reasonable steps we have taken to change our systems for managing those services or facilities; or reasons outside our control. (f) because: we are going to take over, take control of or acquire the business of another bank or organisation offering similar services or facilities; we are going to be taken over or our business is acquired by another bank or organisation offering similar services; or any of those things has happened; and the change will make sure that our customers and the customers of the other bank or organisation are treated in a similar way if they are in similar categories. 18 You must write to us straight away if you change your name or address. If you do not write, you will have to pay our costs of finding you or your new address. You should make sure that the arrangements for receiving mail at your address are safe Unless these conditions say otherwise, any notices or other communications given under them or the special conditions will only be valid if they are in writing. 28 What happens if you cannot look after your finances any longer? 28.1 If we are satisfied that you cannot look after your finances any longer, we will allow your account to be used by anyone who has authority from a court If we allow someone else to use your account under condition 28.1, you may be legally responsible for anything they do. 29 When will we stop you taking money out of your account? 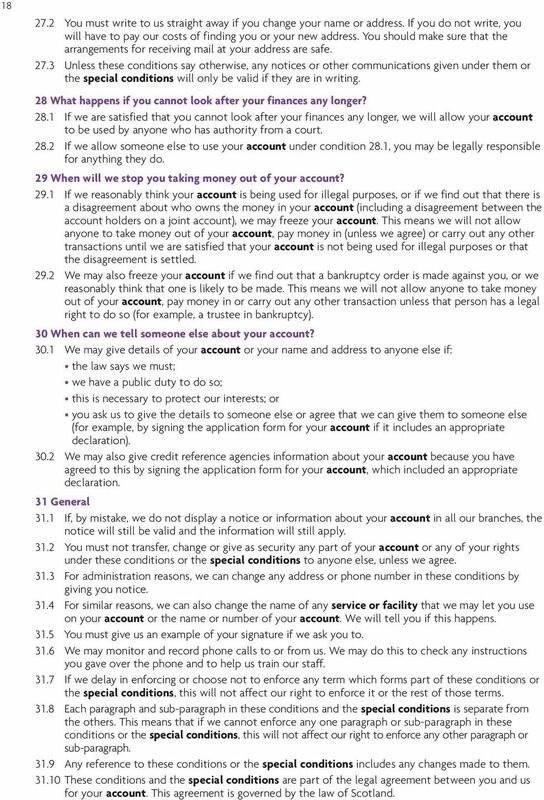 29.1 If we reasonably think your account is being used for illegal purposes, or if we find out that there is a disagreement about who owns the money in your account (including a disagreement between the account holders on a joint account), we may freeze your account. 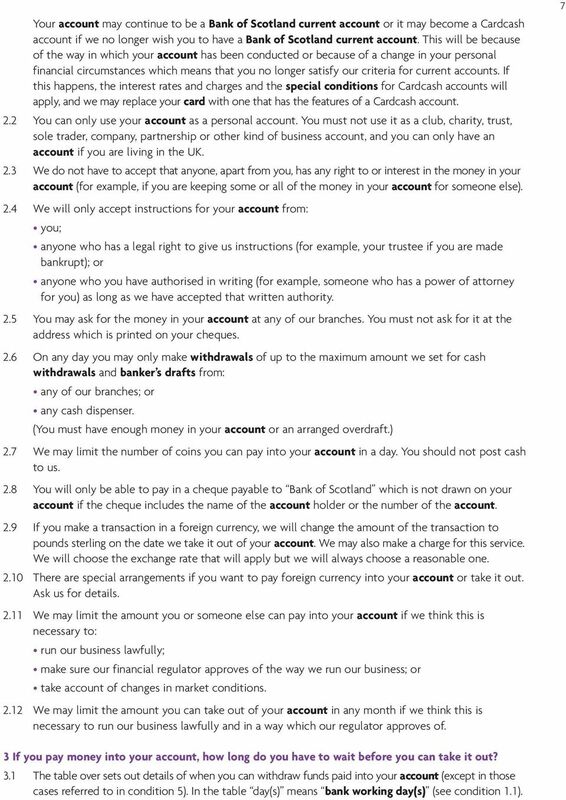 This means we will not allow anyone to take money out of your account, pay money in (unless we agree) or carry out any other transactions until we are satisfied that your account is not being used for illegal purposes or that the disagreement is settled We may also freeze your account if we find out that a bankruptcy order is made against you, or we reasonably think that one is likely to be made. This means we will not allow anyone to take money out of your account, pay money in or carry out any other transaction unless that person has a legal right to do so (for example, a trustee in bankruptcy). 30 When can we tell someone else about your account? 30.1 We may give details of your account or your name and address to anyone else if: the law says we must; we have a public duty to do so; this is necessary to protect our interests; or you ask us to give the details to someone else or agree that we can give them to someone else (for example, by signing the application form for your account if it includes an appropriate declaration) We may also give credit reference agencies information about your account because you have agreed to this by signing the application form for your account, which included an appropriate declaration. 31 General 31.1 If, by mistake, we do not display a notice or information about your account in all our branches, the notice will still be valid and the information will still apply You must not transfer, change or give as security any part of your account or any of your rights under these conditions or the special conditions to anyone else, unless we agree For administration reasons, we can change any address or phone number in these conditions by giving you notice For similar reasons, we can also change the name of any service or facility that we may let you use on your account or the name or number of your account. We will tell you if this happens You must give us an example of your signature if we ask you to We may monitor and record phone calls to or from us. We may do this to check any instructions you gave over the phone and to help us train our staff If we delay in enforcing or choose not to enforce any term which forms part of these conditions or the special conditions, this will not affect our right to enforce it or the rest of those terms Each paragraph and sub-paragraph in these conditions and the special conditions is separate from the others. This means that if we cannot enforce any one paragraph or sub-paragraph in these conditions or the special conditions, this will not affect our right to enforce any other paragraph or sub-paragraph Any reference to these conditions or the special conditions includes any changes made to them These conditions and the special conditions are part of the legal agreement between you and us for your account. This agreement is governed by the law of Scotland. SAVINGS ACCOUNT CONDITIONS. For use from 2nd September 2016. The Terms and Conditions have been clarity-checked and awarded the Clear English Standard by Plain Language Comission (www.clearest.co.uk).